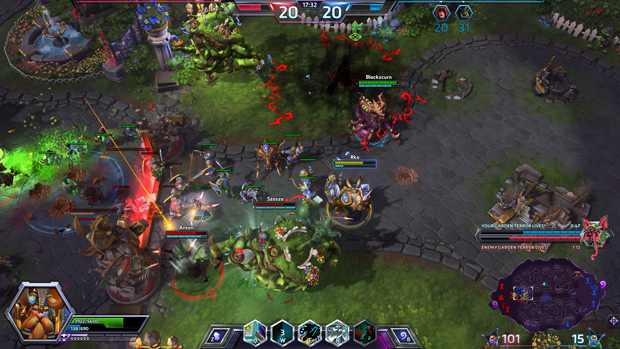 Heroes of the Storm is a ARTS/MOBA game developed and published by Blizzard. 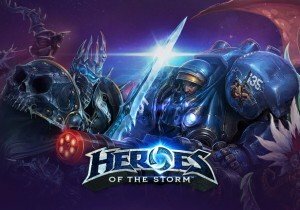 Formerly known as Blizzard DOTA or Blizzard All Stars, HoTS offers unique features to set it apart from other games in the ARTS genre such as Dota 2 and League of Legends. With so many games in this genre popping up, it is essential that HoTS gives gamers a reason to pick it over other games on the market. In mid January, the extremely exclusive beta test was opened to a larger community of lucky beta key recipients and Founder Pack purchasers. 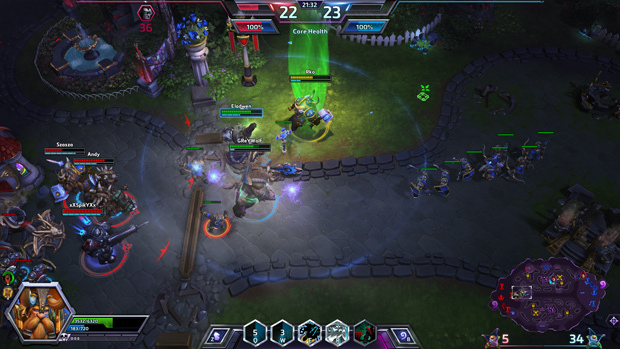 Read on for a look at our thoughts on the current stage of Heroes of the Storm’s beta and learn about what sets it apart from other ARTS/MOBA games on the market. 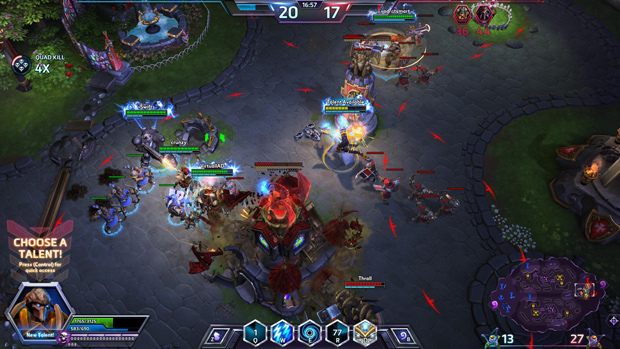 As you would expect from a game in this genre, Heroes of the Storm revolves around the idea of 5v5 battles to destroy enemy buildings and bases. Maps are based on the traditional three lane layout with waves of creeps marching these lanes hoping to take down enemy bases. Instead of farming these waves of creeps for gold and XP, players just gain experience from dying creeps, you do not need to last hit. Furthermore, experience is shared with the team and the entire team levels up together. I have heard complaints from some players that this system causes teams to snowball but I feel it has the opposite effect. With the entire team being on the same level, it is easier to catch up even if one player is not playing well. This also adds some additional tactics in choosing talents as some are more or less beneficial depending on if you’re on the winning or losing side. With these changes, games are much more action packed from the beginning, there really isn’t a farming phase. Even the traditional early, mid and late game phases are different in HoTS with the lack of gold and items. Instead, each map has its own cycles which change the flow of the game. That’s right, maps. There are multiple maps available in HoTS with more to come. While all of these maps, called battlegrounds, revolve around the three lane layout, they have their own unique objectives and mechanics that set them apart. These battlegrounds live up to their name, resulting in action packed games at all points of a match. For example, Sky Temple allows teams to control temples that fire lasers at enemy buildings. These areas must be controlled and enemies can take them over if you leave. My favourite map so far is Garden of Terror. In the night, players can kill plants to obtain seeds. If your team collects enough seeds, one player can control a Garden Terror which is essentially a giant siege monster. This monster can easily take down buildings, kill players, and even disable building attacks. Quality audio and special effects make the objectives of each map not only necessary to obtain, but satisfying to see in action. Gather skulls in the mine to summon a golem for your team. The battlegrounds feel more alive thanks to these changes and their designs. A friend watching me play the game commented on how the map looks like it has some story or background, they are not just like other generic arena maps. Blizzard also advertises the buildings as bases and not just towers. Lanes are protected by walls and two towers which must be destroyed to move on. It’s great to see maps that feel alive and similar to the battlegrounds MMORPG players are more acquainted with. Games also tend to be shorter than other MOBAs, both in actual time taken to destroy enemy bases, and because the game is a frantic rush for objectives from start to finish rather than featuring a drawn out early farming phase. You have the choice between many heroes to play on these battlegrounds. These heroes come from all of Blizzard’s games such as World of Warcraft and Starcraft. If you ever wanted to see who would win, Kerrigan or Illidan, HoTS has the answer. Having played all of Blizzard’s games, I instantly came to love these heroes, their skills, and characters. Somehow heroes from different universes fit into one game, it never felt like a hero was out of place thanks to Blizzard’s art style. Thankfully if you’ve never played Blizzard titles, a simple role categorization will give you a briefing of what to expect from each hero. Assassins offer bursty kits for setting up or securing kills. Warriors soak up damage and often put pressure to push enemy damage dealers out of a fight or objective. Support offers a variety of utility from heals to CC reduction to movement speed bonuses and everything else you’d imagine in this role. Specialists tend to be middle of the road, offering elements in the middle of these more defined roles. As a result some of the heroes seem odd compared to typical MOBA’s more defined characters, such as the High Elf Priest Tyrande falling somewhere between a ranged hunter and support. Heroes are equipped with three basic abilities, one trait (passive ability), and the choice between one of two heroic abilities (ultimate). Only the ultimate skill must be leveled up, all other skills are available for use at level one and are only improved through this talent system. 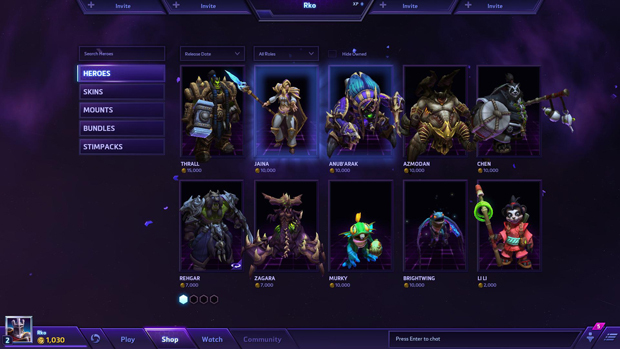 In order to provide some sort of customization with the lack of items, heroes use a talent system similar to that in World of Warcraft. After leveling up players can improve certain aspects of their heroes such as skills and basic attacks. Once again, Blizzard’s art style looks amazing. I am OK with this leveling system as it lowers the skill curve for newer players and avoids scaring them away from the complex nature of ARTS/MOBA games we have come to expect from games such as Dota 2. However, I am not a fan of the additional hero leveling system outside of individual matches. At the end of each match players gain experience towards the hero they were playing. Leveling up heroes unlocks additional talents or heroic abilities. This system puts players that have invested more time into certain heroes at an advantage over newer players. What I love about the ARTS genre is that in each match all players start at a level playing field and use their skills to get ahead. You should not be able to get ahead from the beginning of matches just because you invested more time into your hero, this is not an RPG game. Even if you believe it can be balanced, we all know as the number of heroes available grows, this will become an ever growing nightmare for Blizzard. Another problem I have with this game is that heroes need to be purchased from the shop! There is a weekly rotation of free heroes but if you want to have a hero available at all times, you must purchase them with either in game gold or real cash. It can take a long time to obtain heroes with in game gold as they cost anywhere from 2,000 to 10,000 gold. You gain 10-30 gold per game depending on the outcome, but you can also gain around 1000 gold by leveling up heroes (only some levels). If you would prefer to use real money, you are looking to spend around $5-10 per hero. You should not have to purchase heroes, I really wish all heroes were available for free. Players can also purchase skins and mounts. Heroes can ride mounts when out of combat to speed up moving between lanes or from base. With proper timing, the mounts make an ideal way for slower melee heroes to get good ganks on unsuspecting opponents. All players start with a basic mount but additional mounts with cosmetic differences may be purchased. This is an acceptable form of monetization but having to purchase heroes is not in a ARTS/MOBA games, it creates imbalance before the game has even begun. As you probably know, the game is currently in its beta stages. However, it runs and plays a lot better than many games past this stage. You can always count on Blizzard to publish well made products. I have not encountered any bugs with gameplay or other server issues while playing. I did hear reports from some players that there are server issues at times, but I was lucky enough to avoid these. I think Blizzard is waiting to publish a Diablo map before releasing this game as the game looks like it is ready to be opened to the public. Killing neutral camps can help to push lanes. In conclusion, I had a lot of fun play Heroes of the Storm. I have spent thousands of hours playing multiple ARTS/MOBA games on the market. Even for an experienced player, the casual nature of HoTS was not a turn off. It’s a great game you can play with all your friends even if they are not good at other games from this genre. 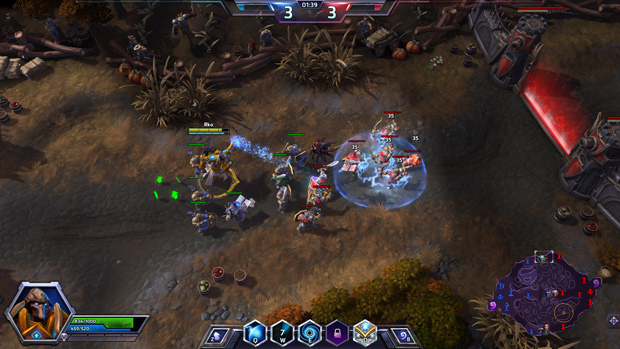 With the relaxed game mechanics, anyone who picks up HoTS can contribute to their team. I hope that the monetization model will change to improve balance but I do not see this happening. Even with this flaw, I recommend everyone to at least try out HoTS. It is a great game for players afraid to climb the steep learning curve in games such as Dota 2 and can even be used as an introduction to the genre. I’m looking forward to seeing what the full release holds! Once again, Blizzard shows us that good graphics are not just about realism. The game looks amazing and runs great. I encountered no graphical bugs or frame rate issues. The art style in HoTS allows heroes from multiple universes to fit into one game, nothing looked like it was out of place. It is essential that games of this genre feel responsive. The controls are really well done and I was never limited in my ability to play because of lackluster controls. I am used to playing games of this genre on just one map. However, Blizzard has so many maps to offer that the gameplay is always changing. It will be a while before players get bored of the content offered in HoTS. At that point, Blizzard can just release more maps. The number of hero choices is already quite large, and the traits feature makes each of them feel like they have many diverse ways to play. In order to simplify this game, Blizzard had to cut out a lot of the customization we have come to love from games of this genre. Teams level together, you cannot purchase items, and the skill system is simplified. This is great for casual games but results in there being an overall lack of customization. On the positive side, their clear focus on cosmetic customization already shows surprising quality for this stage of development. From my experiences in this game, both solo and with friends, the beta community has been mature and helpful. This is not what you would expect from a ARTS/MOBA game, or any team game for that matter, but this might change upon full release. There are looking for party features and incentives offered to players queuing together in place to improve the community. It is hard to comment on community until the game has been released as the beta community is almost always better than the release community. But hopefully the unified experience system removes some of the typical MOBA toxicity in the future.